How does one get interested in collecting medals, or anything else for that matter? For me it may have been the simple fact that both my Grandfathers gave me their WWI groups, and somehow 55 years later I am still fascinated in the history of the Royal Navy, medal collecting, and more recently the families of the men who served. I have also thought many times how does one pass the knowledge and interest along to the younger generations who possibly don’t have grandparents who have served. Today I hope to plant the seed that may result in a medal collector for life. 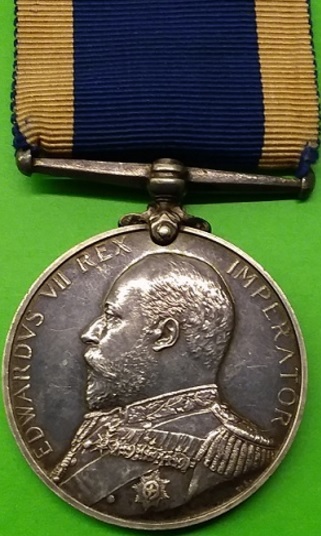 An ED VII LS & GC came up for sale on the British Medal Forum, a forum I would recommend to any collector of British medals to join. Initially offered at 110 pounds, plus postage, it rapidly descended to a very good price at 70 pounds inclusive of postage, and with today’s dollar being high, or the pound being weak, this is less than $100 to buy a substantial piece of history and research potential. I had already proclaimed facetiously “someone please buy this – the original ribbon is worth that much!” To my surprise a fellow forum member, who I didn’t know, asked me if it was a good purchase for his son, who is showing some interest in medal collecting. I said it was a very good buy, and any medal is a good purchase for one’s son. The next day it had been sold. The father is not a RN collector, nor did not have access to Ancestry so I offered to do some research on his behalf. It then dawned on me of what better way to show a young lad what can be done, and how to interpret an ADM 188 series service record. Hopefully, after I finish this post, the son can click on the OMSA link, and see his new medal “on-line” fully researched to the best of my ability, and just maybe he will show his friends, who will show their fathers, and maybe we will have started a new generation of RN historians and medal collectors. So here goes! Medal was said to be named 279513 Robert Watts, STO.PO. 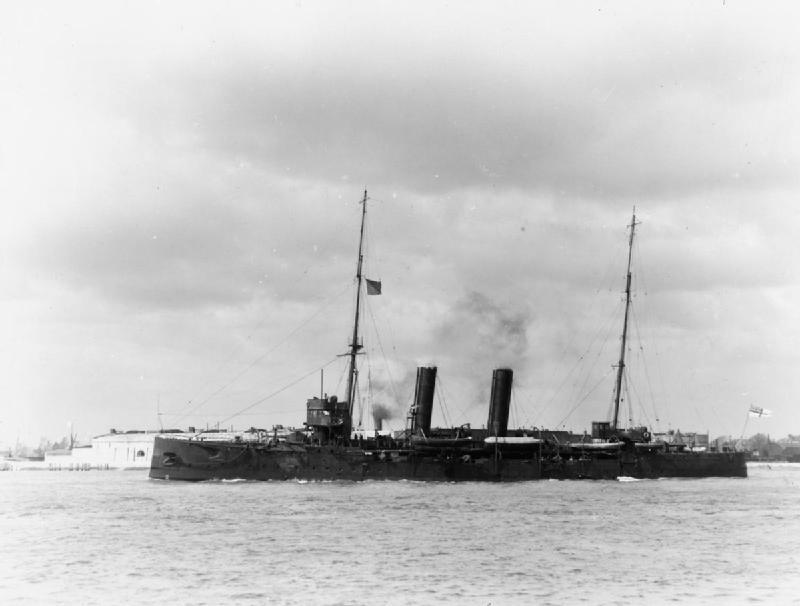 HMS Pembroke, now what would that mean to an 11 year old boy? Well the 279513 is his service number assigned when he volunteers. All RN WW1 medals have these numbers impressed upon the rim allowing the service record to be located. These numbers started to appear on the RN LS & GC medal around 1908, I am not exactly sure when, but early on in ED VII’s reign the medals do not have the number, and certainly by early 1908 they do. 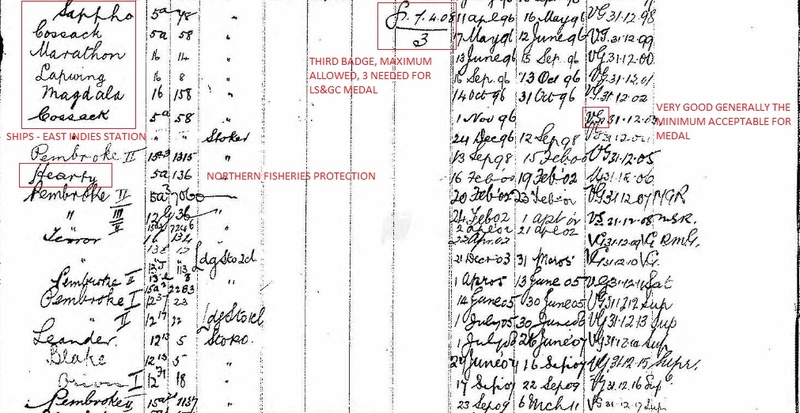 The number is a very easy starting point in finding the ADM 188 service record to match the medal. Go to the National Archive and punch this number followed by ADM 188 and check for “available to download” box and hit enter. With luck you will find the pertinent records which for a small charge can be downloaded. Even prior to downloading it will give his place of birth – West Hartlepool, Durham, and date of birth 21 March 1873. These two data points will be used for an Ancestry search. At this point I may be way ahead of an 11 year old, who may still be scratching his head over STO.PO. 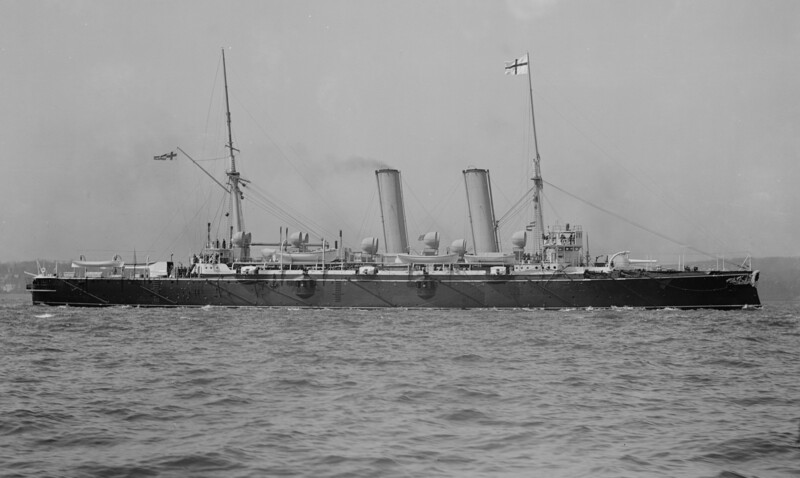 HMS PEMBROKE. Well after the name always comes the rank or rating, in this case he was a STOker Petty Officer when awarded the medal while serving HMS Pembroke (actually a shore establishment at Chatham). So here is the top of the service record. He signs up, volunteers, on 9 April 1895 for 12 years – at the time the minimum requirement. He is already 22 years old, and has chosen to enter as a stoker second class, an entry level position. Literally this trade was vital to running the ship’s engines, and a vast number of the crew were assigned to this dirty, back breaking trade of shovelling huge quantities of coal into the furnaces to generate the steam to run the engines. They were also the poor souls that had to take on coal at the many coaling stations around the empire – literally a sack at a time. The coaling of a ship was a filthy business, and those men who grew up in the sailing navy looked down upon it! Although by 1895, the sailing navy was merely a memory of some of the old salts. 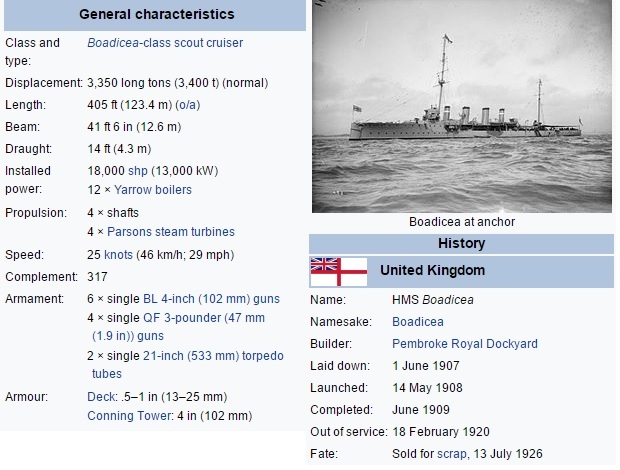 The man’s “sub-ratings” were often his second specialty where he had received training, often in the field of gunnery. The cryptic TM means trained man, and was the most basic of small arms training, also possibly some cutlass drill. One will find SG (seaman gunner), GI (Gunnery Instructor), CG (Captain of the Gun), TI (Torpedo Instructor), GL (Gun Layer), and Diver to name a few. The “Badge” were his good conduct badges. Continuous very good ratings for a set period of time resulted in a GCB which was a small stripe on the end of the sleeve and some extra pay – not the chevrons of a Petty Officer (corporal and sergeant stripes). In Well’s case, he receives his first G1 9.4.98 precisely 3 years after he joins up, and his second 5 years after that. All of his Character assessments were Very Good. Acting Chief Stoker and eventually Chief Stoker. 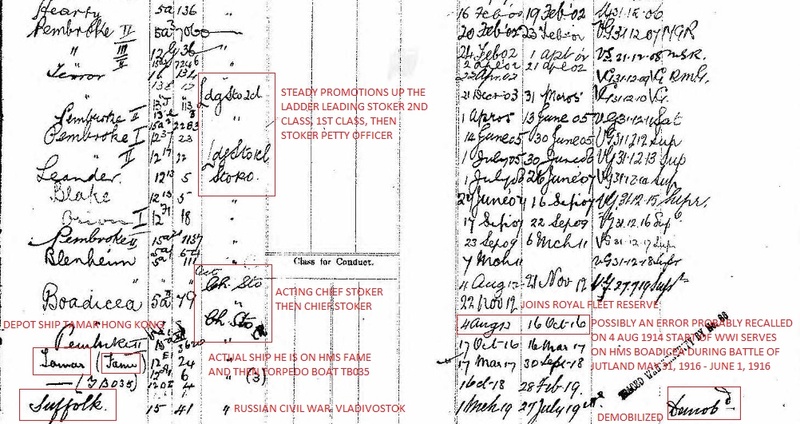 One should note that that he joins the Royal Fleet Reserve on 22 November 1912, and probably gets recalled when England declares war on August 4, 1914, although it clearly says 1913 I believe in error. The ships during WW1 often are shown in brackets. 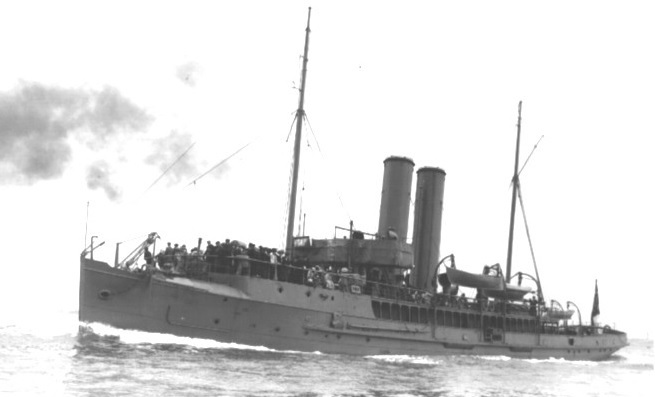 It appears that after serving on HMS Boadicea at the Battle of Jutland and then ends up in Hong Kong assigned to the depot ship HMS Tamar for accounting purposes, but is actually aboard the destroyer HMS Fame and then the Torpedo Boat 035. 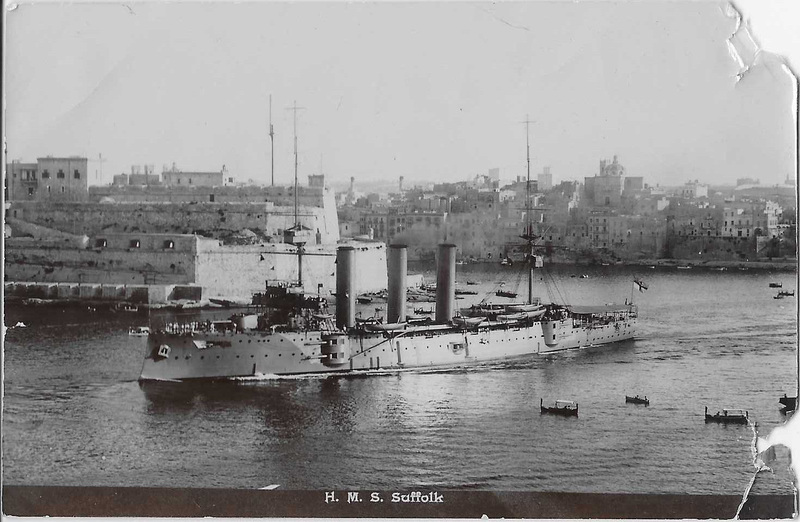 HMS Suffolk was also at Hong Kong, and goes on to assist in the Russian civil war – many don’t realize that although the war with Germany was over on November 11th, 1918, many continued to serve during the Russian conflict which did not end happily for the Tsar and his family. And finally the bottom of the service record. The most important part being “Traced Medal 26.4.10” which indicates the award of the LS & GC medal 15 years plus a few days after volunteering for his first 12 year engagement. Many of the notes one finds are cryptic, one has to familiarize oneself to the terminology and abbreviations of the time. You will find mention of bad behavior, gaol time, time spent in cells, medical conditions, DSQ (discharged sick quarters) often to Haslar the Naval hospital. Good Conduct Badges also got “deprived” marked with a “D” and restored marked with a “R”. You could lose one or two and maybe how repentant you were, or how forgiving the officer was, they could be restored sooner or later, but they could make or break your chance for the LS & GC medal which in theory required an unblemished career, much like Robert Well’s. So there you have his service record, almost 25 years, but who was he and where did he come from? This is when you punch in his name, place and date of birth into Ancestry and see if he came from a long line of sailors which often occurs if one was born in Portsmouth or Plymouth or their surrounds. But this man was born West Hartlepool, and it would appear his mother came from Whitby, Yorkshire. Two of the three cities bombarded by the German Navy on cities 16th December 1914, Scarborough being the third, causing a public outcry and 137 fatalities and 592 casualties, mostly civilians. Here we find Mary Hubbard and her three children, Robert, James and Caroline, nicely matching the 1881 census, minus James. Mmm…I said wonder if he joined the RN too – he did, as 149392 James Hubbard, born 1874 West Hartlepool, Durham. He serves 1892-1904 to complete his 12 year commitment. He is awarded 2 GCBs, one getting deprived and then restored, is a Able Seaman receiving several sub-ratings – inclusive of Seaman Gunner, and C.T.G which I will guess is Captain of the Turret Gun. I find no further census records for either of these brothers. Checking for futher medal entitlement for either brother comes up blank, with the exception of Robert’s WW1 trio, which at the present is separated from his ED VII LS & GC medal. One does wonder what caused Robert to change his name from Hubbard to Watts. Since I can find no record of his father, maybe he deserted the family, or suffered an early death, and for whatever reason at Robert did not want to be associated with the Hubbard name. 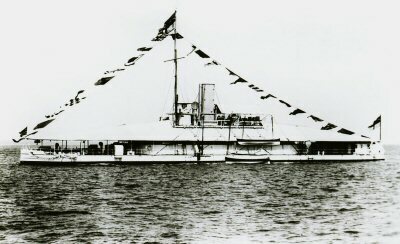 HMS Pembroke II – was shore establishment for Chatham. Aside from gunnery practice Magdala remained in Bombay Harbour for her entire career. 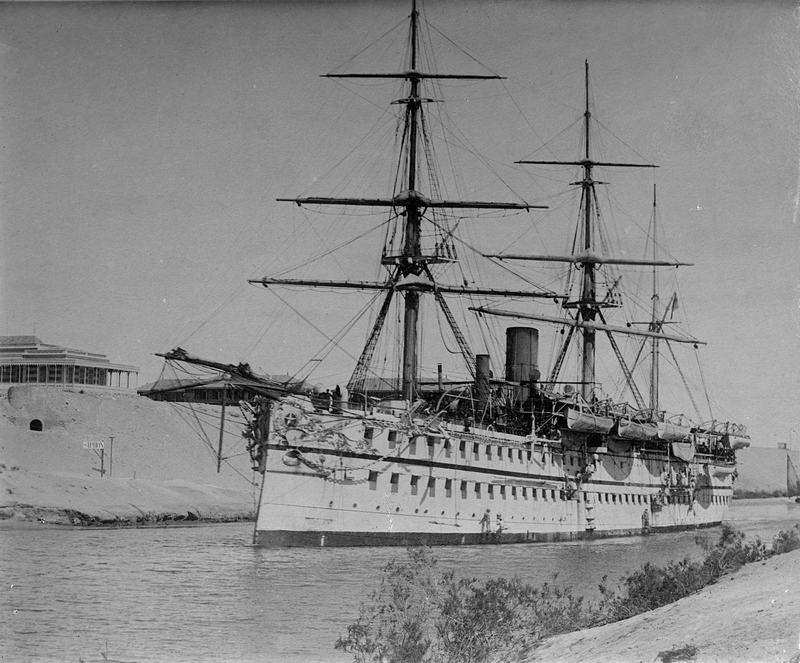 The ship was sold for scrap in 1903. 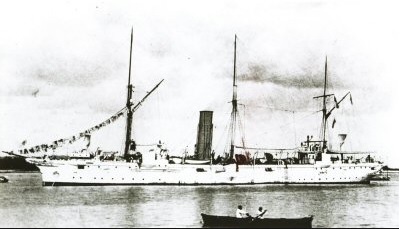 HMS Hearty was a 1,300 ton twin-screw Special Service Vessel commissioned at Sheerness in 1889 for protection of Northern fisheries. 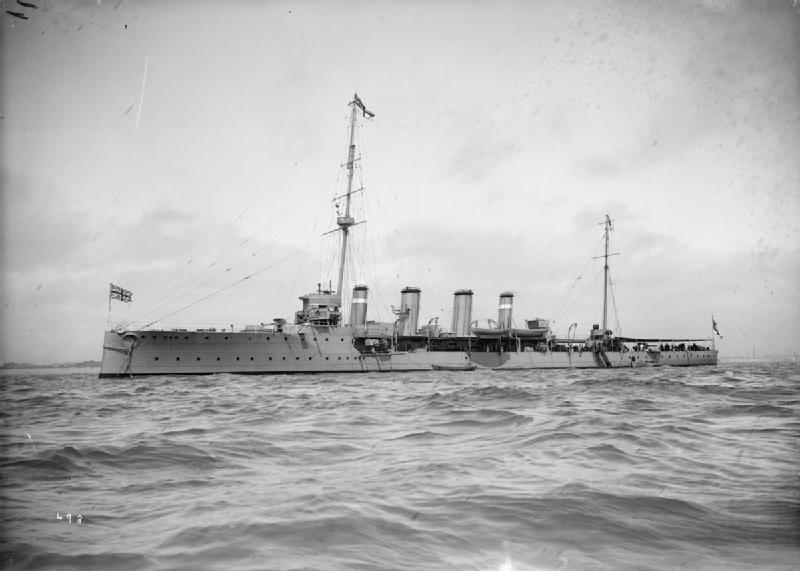 Also assisted in finding the wreck of HMS Cobra. Leander had as tender to her the depot ship Tyne, and the torpedo boat destroyers: Albatross, Ariel, Banshee, Bat, Bruizer, Chamois, Crane, Cynthia, Desperate, Fawn, Flying Fish, Griffon, Kangaroo, Mallard, Myrmidon, Orwell, Panther, Seal, Stag and Thrasher. 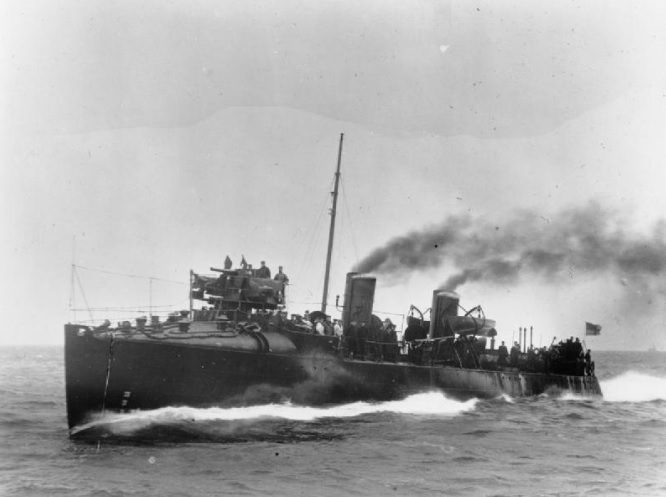 HMS Blake was later converted to a destroyer depot ship in 1907. Very nice blog with lots of good information. I hope that this will encourage the younger generation to get a taste of the potential story of a man’s career and experiences when we look in to the man behind the medal. Great job, Pick. Do mine next. Well done, and very inviting for the beginning collector.